Allowing for the teething problems of thousands of employees moving into a new building, the saddest contrast is the lack of aspiration revealed in the second example – including the telling assumption that lunch is eaten at one’s desk. 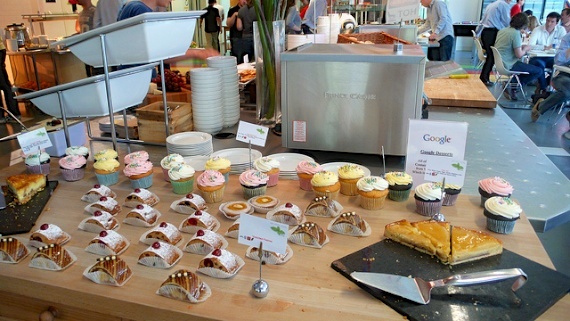 Google explicitly nurtures the canteen as a stage for social interaction. An interesting article in Slate describes how Google is pioneering – as befits an engineering culture – a data-driven approach to understanding the best ways to motivate its people. Its renowned staff canteens are the least of it. It has transformed retention of female staff by extending paid maternity leave. This is at no cost, since the company saves on recruitment spending. Google has also discovered (or should that be confirmed?) that good managers get better performance from their teams than poor managers. It’s using coaches to support less successful managers – who go on to achieve sustained improvements in their feedback scores. As with John Lewis, Google is succeeding by mining the correlation between the corporate interest and happy staff.